The craftsmanship artwork, which you can admire today on shops and markets is the top of a tousand year old experience and improvement and shows the real soul of Abruzzo. Under you can find a list of most important craftsmanship works of our region. Stone, wood and iron, the nature prime materials, are refined by fine hands and transformed in little artworks for everyday needs. That’s craftsmanship. The nature has given everywhere in Abruzzo its greatest treasure to whom loves and respect it most. Here men have seen the nature abilty of using its finest material and have made this ability to their own, creating shapes from first materials. It’a not a lucky event that has made the ceramics of Castelli well known all world round, or the blacksmiths of Guardiagrele the proud of the whole region, or that Fara San Martino has become the home of Pasta, while the Confetti of Sulmona accompany the happiest moments in life. But there are little suburbs, where the craftsmanships create unique works of art. 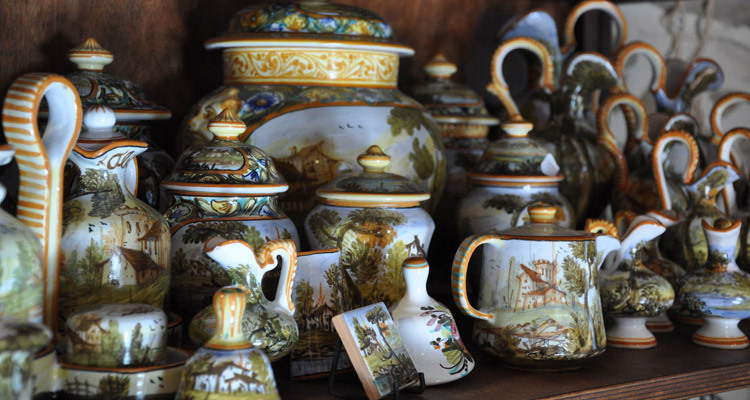 Interesting are the engraved wooden works of Pretoro and Castel del Monte, the ceramics of Rapino, covers and carpets of Taranta Peligna, the filigrees and laces of Pescocostanzo and Scanno. These are works made for centurys that represent the wealth of a hard-working people.